On October 6, 2009, I departed Black Canyon City, Arizona via Interstate I-17 North around 2:00 PM. 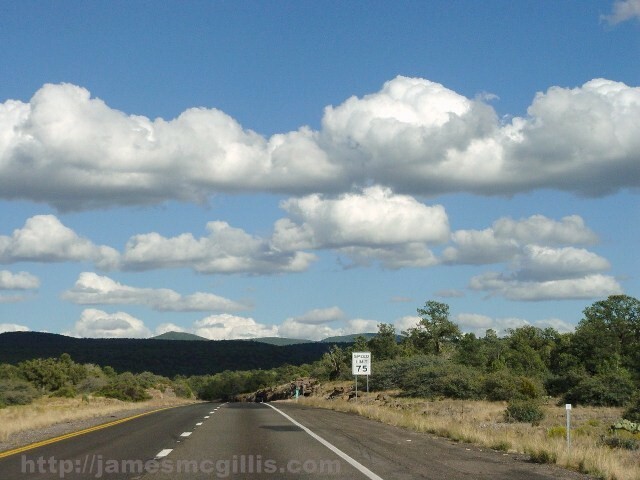 With nothing but interstate highway, puffy clouds and a five thousand foot elevation gain between there and Flagstaff, AZ, I was on the road again. After passing Cordes Junction, AZ, the next town of significance is Camp Verde, AZ, in the Verde Valley, AZ. Before making my ascent of the Mogollon Rim, I stopped at the intersection of I-17 and Arizona Highway 260 for a break. 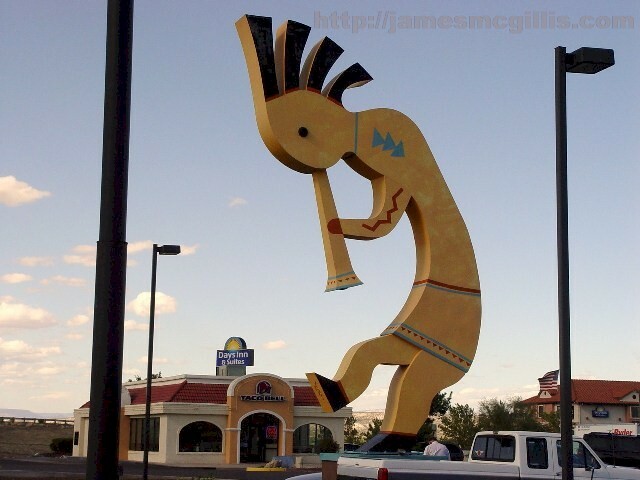 During a previous stop there, I discovered the self-proclaimed, “Largest Kokopelli in the World”. 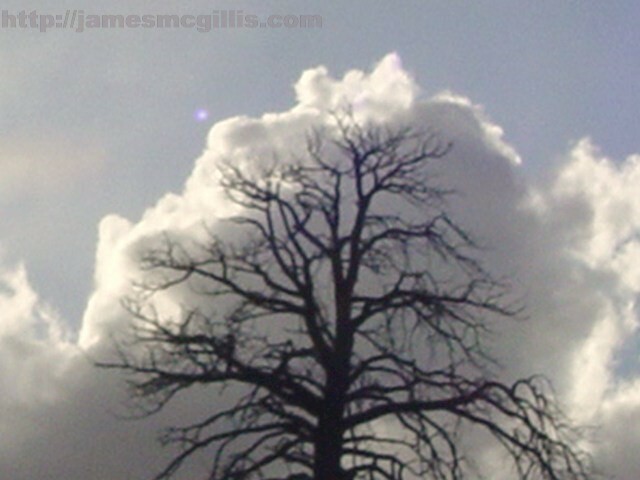 Standing at least fifty feet tall, I had to admit that I had never seen one larger. Since Kokopelli is a character in my new online novel at JimMcGillis.com, I took pictures of my plush Arizona Kokopelli together with Giant Kokopelli. Since Kokopelli is a spirit, his apparent size at any given time is superfluous. Flagstaff, AZ dates to the railroad era of the 1880s. Later it became a major stopping point on Old-66, the mother of all U.S. highways. 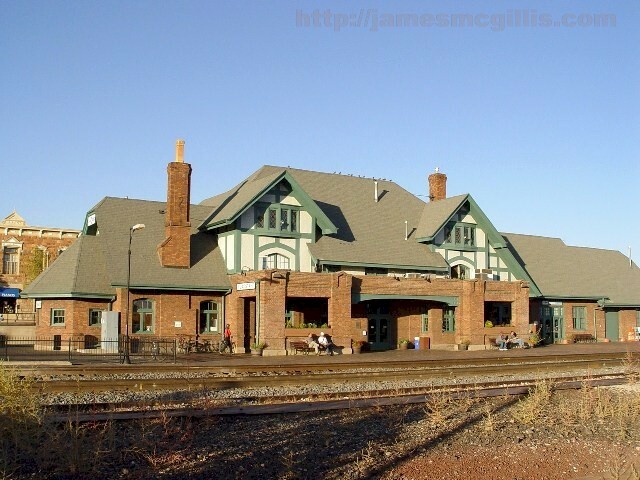 If you enjoy seeing U.S. history still thriving, a visit to the Flagstaff railroad station is worth your time. However, if you are short on time and plan to travel north on U.S. Highway 89, I suggest a detour east on Interstate I-40, bypassing Flagstaff altogether. A few miles east of town, a new interchange speeds you to your connection with U.S. 89 North. 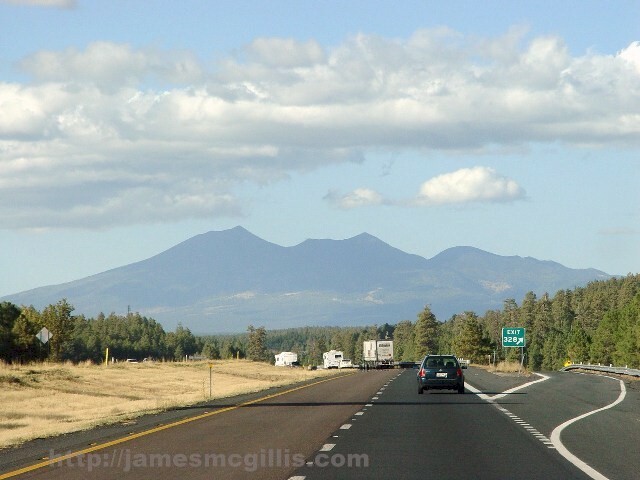 By doing so, you will save up to an hour on the streets and highways of Flagstaff. If I did not now comment on the San Francisco Peaks, I would be remiss. From vantage points up to one hundred miles away, a traveler might catch a glimpse of these magnificent mountains. The use of the word “peaks” indicates that there is more than one. Although we now see separate peaks on the horizon, it was not always so. 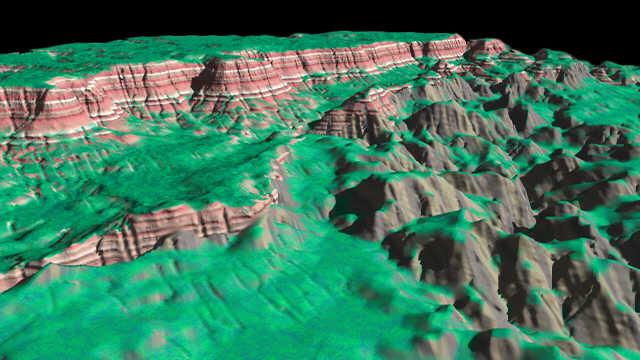 At a time in prehistory so remote that nothing else about the area might seem familiar, a precursor mountain stood in that prominent location, rising to an elevation of over 25,000 feet. In order to imagine that giant, primordial mountain, take the sloping sides of the lower mountain and extend them up to where they would naturally meet in a single peak. Mt. Humphreys, the highest of the San Francisco Peaks is 12,633 feet in elevation. Its mother peak was approximately twice Mt. Humphreys’ current height. After skirting Flagstaff to the east, I stopped for fuel at what looked like a frontier truck stop. God may know what goes on inside that building, but I did not enter. Instead, I paid at the pump and prepared to drive north. 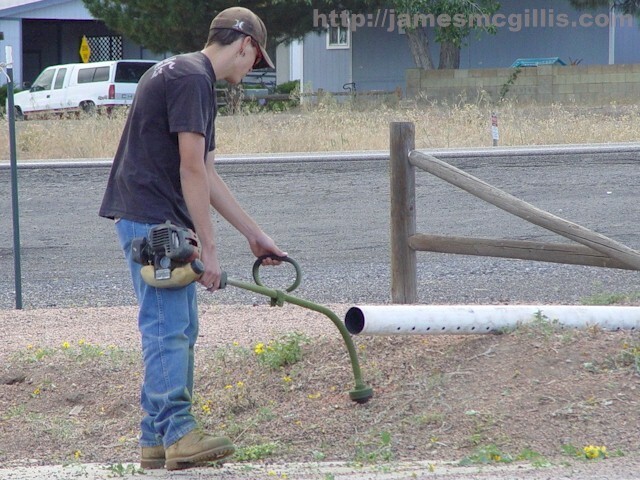 When I arrived, there was a young man out front, operating a motorized weed-eater. Systematically, he vaporized the late season wildflowers from the area between the station and the highway. By the time I departed, he had destroyed half an acre of wild flowers. On Earth, some humans are born, live and die without ever seeing a wildflower. Thus, the young man’s behavior intrigued me. Approaching him, I asked, “Why are you cutting down all the wildflowers?” “The owner paid me to do it”, was his answer. After several minutes in which I made no more progress than I did with my first question, I wished him good luck and departed. By then it was late afternoon and across the road, the sun sank lower. Since my recent travels were during summer, I did not anticipate how early the October sun might drop below the horizon. Although I had traveled U.S. 89 North before, I had never seen it in late afternoon sunlight. Before turning east on U.S. Highway 160, I caught a sundown glimpse of the eastern end of the Vermillion Cliffs, known here as Echo Cliffs. After turning east on Highway 160, the sun offered back-lighting to the scenery. 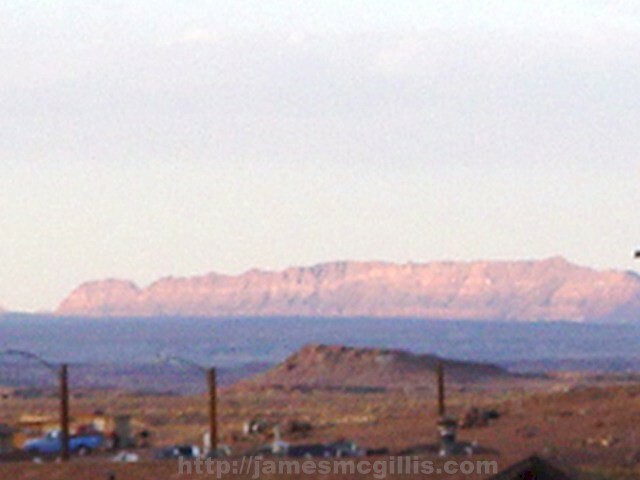 The Kerley Valley, west of Tuba City, AZ was awash in golden light. Toward sunset, even the desolate sandstone came alive. Although I had prior experience on that highway, I now saw things in a new light. Somewhere on that stretch, lost in thought, I stopped thinking all together. For a moment, as I returned from my rolling meditation, I did not know where I was or where I was going. At Tuba City, the light was fading fast. As darkness fell, I had fifty miles to travel before reaching Navajo National Monument. My consciousness faded again. Was this a four lane, divide highway? No, it was a two-lane highway and should stay in the right-hand lane. 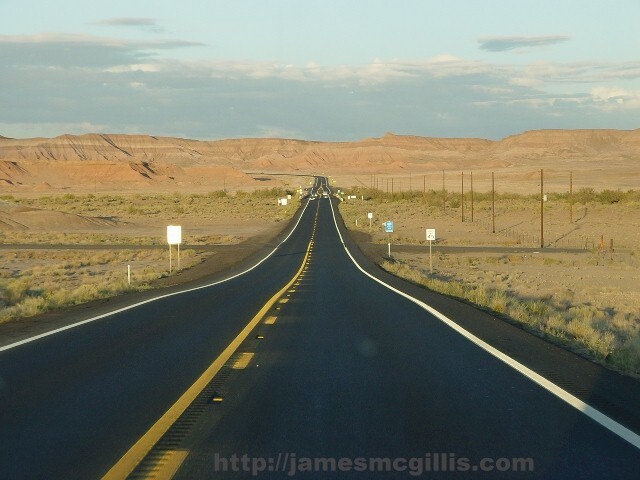 After turning off U.S. 160 at Black Mesa, I still had nine miles of dark road ahead. Upon my arrival at Sunset Campground, darkness fell and stars began to shine. At my 7200-foot elevation, it was 43 f. degrees and the temperature was dropping fast. Although the San Francisco Peaks are often visible from there during daylight, that night those dark peaks hid from my sight. Holding my breath as I approached the campground, I found that my favorite pull-through campsite was available. Setting up and leveling a travel trailer in the dark can be a daunting task. Having camped in the same spot at least six times in the past four years, I knew exactly how high to raise the left wheels of my coach. In fifteen minutes, I was inside my coach, turning up the thermostat on my forced-air heater. 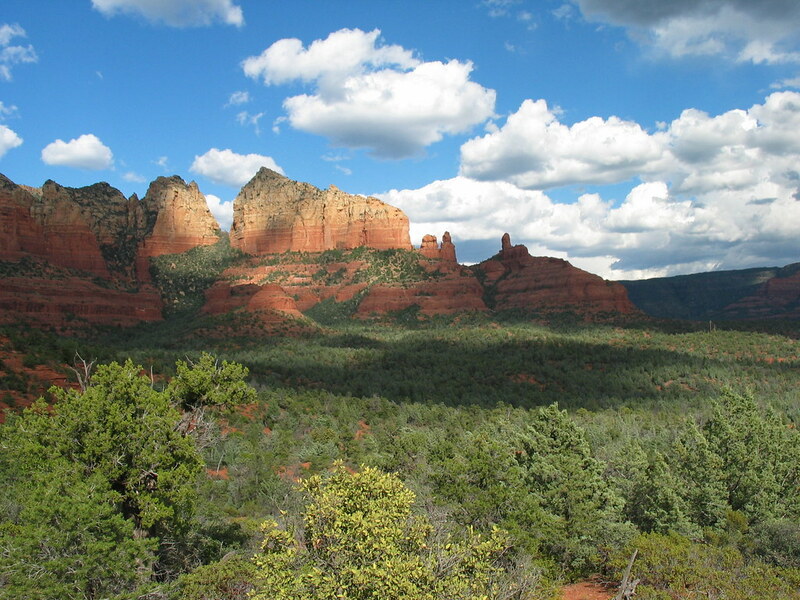 During the summer, most of Arizona is on Pacific Daylight Time. The Navajo Indian Reservation, which surrounds Navajo National Monument, adheres to Mountain Time. Instantly, it was an hour later than it had been all that day. As is my habit, I walked the campground loop before bedtime. 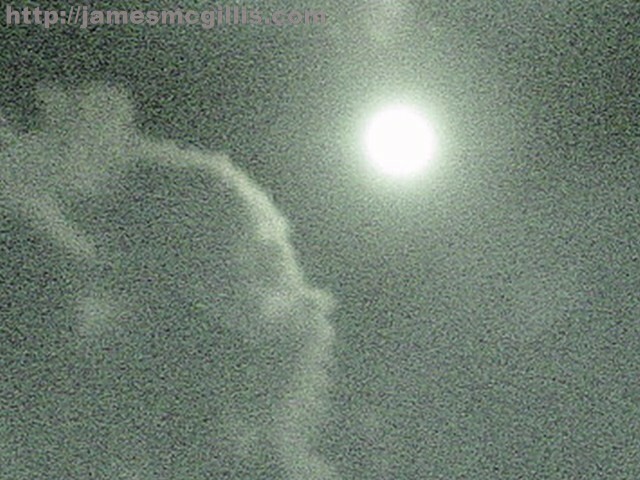 Clouds scudded across the night sky, first hiding the Moon, then allowing its light to shine down on me. By midnight, I was in bed, asleep. Several hours later, I heard loud, staccato raindrops falling on the roof of my coach. Although the noise startled me from my sleep, I could not reconcile my quick awakening with the fact that I had slept through many rainstorms in my coach. When the shower subsided, I was soon a sleep, only to reawaken to the sound of several more rain squalls overnight. In the morning, when I awoke, I looked outside and saw what looked like remnants of an overnight snowstorm. When I went outside to investigate, I realized that the noisy rain had been a series of hailstorms, culminating in a final cloudburst. Although they arose to no apparent signs of damage, two Harley Davidson riders who had camped nearby had little rest overnight in their small tents. With two hundred and twenty-five miles to go that day, I broke camp and departed around midday. My next stop was Monument Valley, which straddles the Arizona - Utah state line, and by nightfall, on to Moab, Utah.